With minimal rainfall since the start of the year, towns across the Eastern Eyre Peninsula are battling to keep their beloved sporting ovals green as water storage runs out. 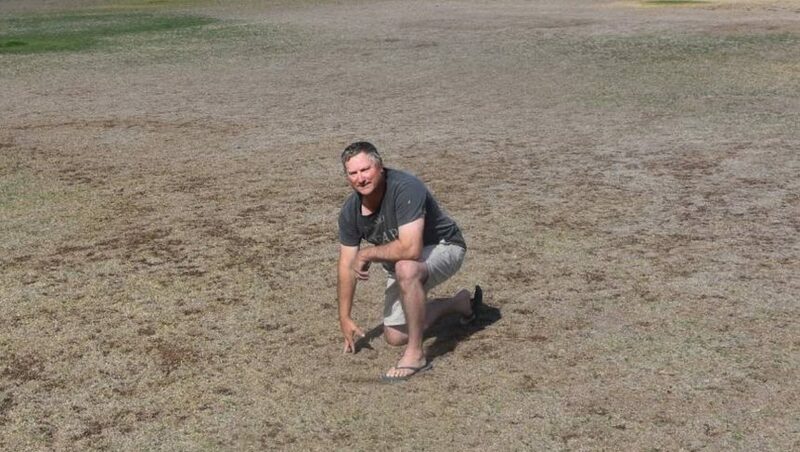 Patches of grass at the Kimba Oval have gone untended after the town’s dam ran dry late last year. In Cleve, sporting bodies is spending about $500 a week on mains water just trying to keep their oval alive until the rain comes. Groundsman Shane Duncan said the dam ran dry around Christmas. “Just when we had the oval looking nice and pristine, we ran out of water,” he said. Mr Duncan said it was disappointing to see the oval in poor condition, because town ovals were a “centrepiece” for the community and provided a service that went beyond local cricket matches. He said the oval had a wider value for the school, community events and a variety of sports. “It’s disappointing for the community when it’s not a centrepiece,” he said. Down the Birdseye Highway the Cowell oval sits in stark contrast, looking healthy despite its location in one of the most drought-affected regions across South Australia. The recently developed sub-surface irrigation system as part of the town’s Community Wastewater Management Scheme (CWMS) has been keeping the oval green despite little to no rain. Franklin Harbour District Council chief executive officer Chris Smith said the CWMS, now around two years old, had reached a “tipping point” and was now collecting more water than was required to keep the oval healthy.